We believe, as all second-hand booksellers must, that an old book is as good as a new one for a reader. However, interesting new books keep on being published, and so we carry a small selection of those too – some of which may have been launched at Zozimus Bookshop, while others are of local or personal interest. 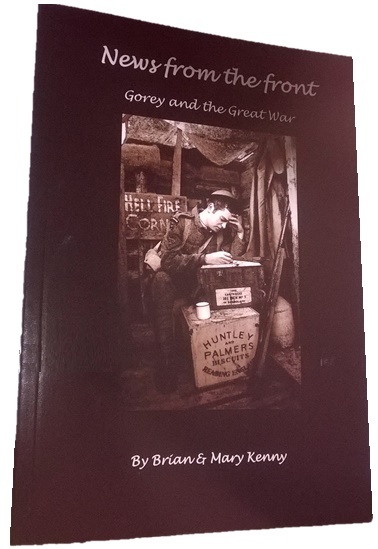 News from the Front: Gorey and the Great War by Brian and Mary Kenny (Paperback €15) Now available again: A fascinating collection of reports from contemporary newspapers about Gorey people who were involved in World War One. The book is well illustrated, often in colour. Out of print within months of publication, a limited number has been republished by Zozimus Bookshop. Records and Revolution: Cryptic Connections from Wexford’s Church History by Christopher Power (Paperback €12). The latest from the pen of our indefatigable local historian, this book is informed by the author’s researches in the Wexford Diocesan Archives, and is illustrated by many of Chris’s own photographs. We also stock many more of his books of local and revolutionary history. Fledglings: An Anthology (Paperback, €10) An elegant gathering of prose and poems by 18 members of the Gorey Writers Group, which has been meeting for over ten years. Introduced by John Wyse Jackson. Glenmalure: The Wild Heart of the Mountains by Carmel O’Toole (€25). Subtitled ‘A Valley and its People’, this chronicle of past and present is a must for anyone who knows the area. A beautifully made book, full of detail in both the text and the pictures. Walking-Class Heroes? Dublin’s Remarkable Street-Personalities 1955-2015, by Rory Campbell (€30). This unique and beautiful album contains portraits in words, ink and, surprisingly, impeccable crayon, of many of the well-known or half-familiar ‘characters’ who have walked, shuffled or danced through the streets over the last six decades. Campbell’s faux-naïve artistry captures perfectly these often lonely figures, many of them in the grip of apparently inexplicable obsessions, from Bang-bang to the blind accordionist on O’Connell Bridge. The book is not very widely distributed, but we will always have signed copies in stock – as long as the short print run lasts! Best-Loved Oscar Wilde by John Wyse Jackson (Hardback €13) was launched at Zozimus Bookshop in 2015. It is a representative selection of Oscar Wilde’s varied writings. Both familiar and more unusual pieces are included, making it ideal for beginners and Oscar fans alike. Beautifully illustrated by Emma Byrne. Kilmacurragh: Sourced in the Wild by Megan O’Beirne (Hardback €30) An expertly illustrated exploration of Kilmacurragh, the forgotten horticultural jewel of Wicklow, and of the garden’s history. Introduction by Peter Wyse Jackson. Forgetting to Remember by Mark Hayden (Paperback €20) is now on sale at Zozimus Bookshop. A challenging and sensitive book about how Ireland has remembered, and failed to remember, the Irish who fell in the Great War. Same Bridge Perhaps and other fugitive poems by Hugh Maxton. Paperback €12 (Launched at Zozimus Bookshop in 2013, this is Maxton’s eleventh collection. The title poem, ‘a complex meditation on borderlands in political territory and in human consciousness and language,’ is dedicated to former President Mary McAleese. Same Train, Different Track: Poetry and Short Stories by Chris Black (Paperback €12) A refreshing first book by a writer who since moving to Wexford in 1986 has become a familiar presence at poetry readings and literary festivals. Learning to Love Ireland: An Immigrant’s Tale by Althea Farren (Paperback €12) was launched in the bookshop on 8th August 2014. It bears the imprint of Zozimus Books, our ‘publishing wing’. It is a personal book, and a fascinating read. In 2007, Althea and Larry Farren sold home and business and left Zimbabwe to begin new lives in Ireland. Both were in their sixties, but had no pensions – hyperinflation had rendered the Zimbabwe dollar completely worthless. In their new country they could speak freely without fear of President Mugabe’s Central Intelligence Organisation; they no longer had to queue for bread, sugar and cooking oil. After a while, however, the novelty began to wear off. It wasn’t just Ireland’s climate. Althea began to feel desolate, anxious, isolated and bereft. She missed her home. She had no job. They had very few friends. And in 2007, the recession was biting. Then she discovered that her inability to function effectively in her new environment was perfectly normal, a predictable effect of ‘culture shock’. Loss of the familiar often causes a sense of isolation and diminished self-esteem, leading to frustration, instability and hostility. Her book is an account of the process of how she and Larry found themselves again in their new country. If we in Ireland have a genuine wish to be part of the modern, multicultural world, Learning to Love Ireland has lessons for us all. It tells us things about ourselves that we never knew we knew. Zozimus Books is proud to be associated with it. Hear the Colour (Paperback €9)by Joe Neal is a collection of poems that are, as ever with this poet, playful and touching by turns , exploring the worlds of memory and of nature. We still have a few copies of his previous books, Turn Now the Tide (Paperback €10) Telling it at a Slant: Tales from the Heart and Other Places (Paperback €9), more witty and moving verses by the Wexford writer and actor.